Open jobs listings on Palm's website indicate the company is preparing for Linux development for a new generation of Palm devices. This is a positive sign that the company is already preparing for developing new mobile devices using Palm OS for Linux. A search for "linux" on Palm's job site currently returns 13 engineering positions. The company is hiring for linux software engineers, smartphone browser developers as well as a positions for Mobile Handset development. As the Senior Software Engineer, you will play a key role in the architecture, design and implementation of enabling technologies for a new generation of Palm devices. Working as part of the overall system team, you will work on the underlying support for various software applications. The job openings are clearly an indicator that Palm is preparing for the upcoming linux Palm OS products from PalmSource. During PalmSource's last investor conference call, CEO Patrick McVeigh announced the company is shifting all engineering efforts on the future Linux based versions of the Palm OS. There are two versions of Palm OS for Linux under development. The version for low-end and feature phones is planned to be completed by summer 2006 and a high end version for smartphones is expected to be ready in the second half of next year. Palm Inc previously announced that it has renewed its Palm OS license through 2009. Thanks to Brighthand for the tip. Well, no Cobalt is now official. Palm passed right over cobalt. Oh well, i'm not suprised. RE: Well, no Cobalt is now official. This guy, who claims to have inside sources, still confidently claims the Treo 700 is coming in two months, and has cobalt. Either PALM, Inc. is going to buy PSRC or they are going to sidestep PSRC and do their own OS in-house. Why else would they try to hire so many Linux Developers? The question is, who owns the POS GUI? PSRC??? So that means PALM needs to buy PSRC? I meant to also say that perhaps "Cobalt" = Palm/CobaltGUI on Linux. Palm's in the hardware business. That means they have devices that no one else would support under Linux. That means they'd have to do their own driver writing for those devices. In other words, those who still believe a PALM device will have Cobalt installed should stay at rest now. Amen. > The question is, who owns the POS GUI? PSRC??? > So that means PALM needs to buy PSRC? No. Palm has already licensed Cobalt from PSRC, IIRC. > try to hire so many Linux Developers? These descriptions don't seem to be related to OS development, but rather integration and expansion of applications. PSRC should provide the basic plumbing, but the rest (esp integration with enterprise sw), is up to the licensee(s). >No. Palm has already licensed Cobalt from PSRC, IIRC. My point was - Let's say PALM, Inc. wanted to do their own POS in-house. An independent PSRC would never allow it, hence, PALM would have to BUY PSRC in order to wrangle control of the PALMGUI. If 3-4 letters are worth $30M isn't the entire friggin company - (rights to PalmOS/GUI included) worth $160M???? Also, you stifle all POS hardware competition - not that there really is any. well, Palm could have had PSRC for a lot less instead of sending them the $30M and then buying them, back when they were still PalmOne, but buying them at this point wouldn't necessarily stiffle hardware competition as PSRC has licensees other than Palm and Palm would have to honor those licenses. I thought I had been told that the Sprint Windows Mobile Treos were going to be labelled "Treo 700". The only way Palm will release a Cobalt Treo is if they have a deathwish. Bring it on, Mo Fo! They will be buying PalmSource and are preparing for this eventuality, since ultimately Palm will be throwing all of their eggs into the PalmLinux basket. For now, PalmSource owns ALL of PalmOS. PalmSource may be ripe for a takeover within a couple months. Then Palm throws everything they have into PalmLinux. PalmSource is already looking at making alliances with every mobile Linux-related company with a pulse in an effort to get help putting PalmOS on a Linux kernel. I would read this as being that Palm is either planning on creating their own Linux flavored OS, or they're getting ready to replace the current developers after a buyout of PSRC. I just don't see any way that they would hire people to do development for an OS that in the very best case scenario won't be out for at least a year. Penguin, once again, what evidence is there that Palm has licensed PLinux? All they've done is extend their license for PalmOS. I've seen nothing to indicate that they've committed to delivering Linux or anything else. VoR, all the credible reports seem to label the WM Treo as the 670. Marty's back in fine form I see. Palm is in the hardware AND software business, as shown by the legions of software engineers working for the company and their "personalization" of FrankenPalmOS 5 over the past 2 years. Of course, since they seem to be rather incompetent at what they do, more qualified codemonkeys will be needed ASAP. I predict Palm will be taking over PalmSource pretty soon and flushing out many of the "HoBeEn" (Holy Be Engineers), replacing them with people with REAL marketable skills. Except for the minor detail that by floating PalmSource the $30 million when they did, Palm in essence stole that money from shareholders and propped up PalmSource + PalmLinux development with the "free" infusion. So, Marty, are you privy to the fine print in PalmSource's license agreements? What happens WHEN (not "if") Palm takes over PalmSource? Do non-Palm licensees (is it still plural these days?) still get supported? Or do they get "HandEra'ed"
what evidence is there that Palm has licensed PLinux? All they've done is extend their license for PalmOS. I've seen nothing to indicate that they've committed to delivering Linux or anything else. So you think Palm plans to just keep patching Garnet through 2009? Honestly, some of you guys are so afraid not to look cynical in this forum that you end up saying things that are downright stupid. Why would Palm have renewed their Palm OS license for five years if they weren't on board with the roadmap for the OS? People can debate as to whether it's the Cobalt or Linux part of the roadmap that their on board with at this point, but there's no question that Palm has designs on one or the other, if not both. It's only a question of when. >"So you think Palm plans to just keep patching Garnet through 2009? Honestly, some of you guys are so afraid not to look cynical in this forum that you end up saying things that are downright stupid." Dear Optimist - Even Palm's own Bloated Chief Senior Apologist says that "Palm can easily use Garnet until at least 2009." and "Garnet oughta be good enough for anybody." p.s. We have a right to be cynical give all of the shenanigans we've witnessed over the years from both PSRC and PALM. Perhaps we'll be a little less cynical when we can actually buy a device running the mythical Cobalt first shipped years ago. I see. And you apparently agree. I suggest you try thinking for yourself for a change. You might be surprised what you come up with. No Cobalt for you! Now GET OUT! or they're getting ready to replace the current developers after a buyout of PSRC. I just don't see any way that they would hire people to do development for an OS that in the very best case scenario won't be out for at least a year. Partially correct. Yes, Palm will be buying PalmSource soon (probably within months) but they need ADD to (not simply replace) PalmSource's current troop of codemonkeys. Of course, several of the more useless HoBeEn (Holy Be Engineers) will be asked to vacate their cubicles and then be escorted off the premises. Palm's problem is that the smart PalmSource codemonkeys aren't oblivious to the chaos swirling around them and are either in the process of or have already found jobs at more stable companies, leaving Palm with some pretty slim pickings. Adam, don't be silly. PalmOS 5 should have been EOL in 2004. It is simply not realistic to expect Palm to plan a future around an OS that can't multitask if they're serious about PalmOS remaining a viable alternative to Windows Mobile, Symbian and Linux. While I believe PalmOS 5 could be a great OS if PalmSource could clean up the code, given their limited resources and the fact that it's a dead end, PalmSource won't be wasting much time on PalmOS 5. PalmLinux would have been a BRILLIANT platform in 2005 had Palm been smart enough to choose to develop this instead of Cobalt four years ago. By now PalmLinux could have developed enough momentum that it could have become the de facto standard OS for high end mobile devices. Instead, it's a work in progress, already three years behind the competition. Unfortunately, PalmOS' competitors aren't going to wait for them to get their act together and catch up. As was the case with Tapwave, it's possible that PalmLinux's window of opportunity to seize market share has passed. We'll see. I heard it would be the Treo 700, but perhaps things have changed. In any event, it will be here in just a few months. So you think Palm plans to just keep patching Garnet through 2009? I wouldn't have expected them to keep hacking Garnet past January 2004, but they obviously feel differently. Given the fact that Palm has tried to use Garnet for purposes that it was clearly not even remotely designed for (flash storage, hard drives, cell phones, etc. ), there's very little I would put past them. I, personally, would certainly not try to stretch Garnet until 2009, but then I would never have tried to stretch Garnet until now, half-destroying it in the process. Why would Palm have renewed their Palm OS license for five years if they weren't on board with the roadmap for the OS? For one thing, my question was in response to an assertion that Palm has committed to delivering PalmLinux. Whether they CHOOSE to do to or not is irrelevant to the original topic. And for another I'll point out that renewing their license--at vastly decreased prices--in no way commits them to delivering anything related to PalmOS, or upgrading from Garnet. All it does is give them the option of using PalmOS in up to X many shipped products, for a flat fee of Y money. Sony still pays PSRC, and is listed as a licensee, but they haven't produced anything for years. It's a license, not a requirement. To answer your question in the simplest possible terms, Palm has to have a license in order to use PalmSource IP. That includes Garnet. I still have yet to hear an explanation for this assertion that Palm and LG have both committed to delivering Linux-based devices. Wow. Did Kirvin really say those things? That Palmyanna is so intent on rationalizing Palm's mistakes that he "end[s] up saying things that are downright stupid". It's pathetic that someone like Klueless Kirvin actually is being listened to by a lot of people at another Palm site. He has shown he has little understanding of both technical and business matters pertaining to PDAs. Kirvin also insists on ignoring factual evidence that contradicts his (frequently bizarre) positions yet also seems to flip flop on his convictions without blinking an eye. He seems to be an "all or none"/"black or white" type of chap and has difficulty seeing all sides of an issue. These are rather egregious traits for a self-styled pundit to possess. - Palm is a multitasking OS. - OK Palm is sort of a multitasking OS. - OK Palm can't multitask, but who needs multitasking? - PalmOS 5 is "good enough" and all anyone needs. - Palm can survive as a niche player even if their market share plummets to the oft-quoted 3 or 4% (actually more likely 1%) that MacOS now "commands". - There are no significant delays experienced when using the Palm LifeDrive. - Palm OS is dead. - The Company Formerly Known As PalmSource "TCFKAP" "no longer has anything at all to do with mobile computing and probably won't survive in the smartphone market either". - Palm should hire people to post messages to Palm sites. - Windows Mobile device makers ship a lot more handhelds than Palm but they don't SELL more than Palm because most of their shipped devices are returned. There are dozens of other Kirvanisms I could come up with. The list of confused, specious, and truly bizarre things he has posted is actually quite shocking if you look at it. The fact that someone at PalmSource actually interviewed Kirvin for a position shows how out of touch with reality the company is. >I wouldn't have expected them to keep hacking Garnet past January 2004, but they obviously feel differently. Given the fact that Palm has tried to use Garnet for purposes that it was clearly not even remotely designed for (flash storage, hard drives, cell phones, etc. ), there's very little I would put past them. I, personally, would certainly not try to stretch Garnet until 2009, but then I would never have tried to stretch Garnet until now, half-destroying it in the process. > to delivering Linux or anything else. Alas, I must make Skippy happy. My aging memory failed me, and I had misremembered what was in the press release for the license deal. Having reread everything, I have to agree with you that there is no public evidence that Palm has committed to deliver a PLinux phone. Note, they _have_ licensed PLinux. 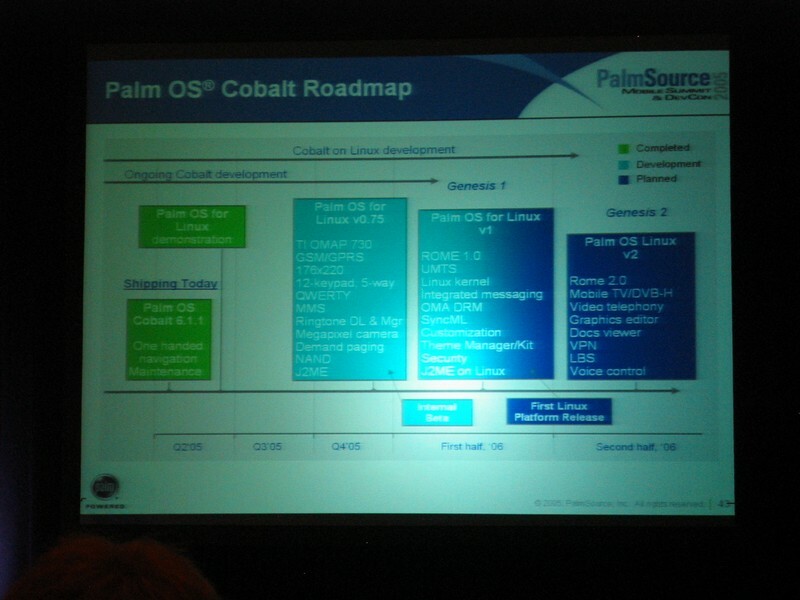 "PalmOS" licenses cover Cobalt going forward, and as the slide Skippy linked to points out, Cobalt, going forward, *is* Plinux. So, they've licensed it, they're apparently hiring linux people, and it's unlikely that they'll stick with Garnet through '09. I infer that they've got plans for PLinux, but no, there's no public evidence. Marty, please try to sort out your Astroturfing personality. Before creating a new Astroturfing personality it's always a good idea to outline exactly what information said personality should appear to have access to given who it is that personality pretends to be. (e.g. pretending as if you're a Regular Joe end user but rattling off details only known to a few company insiders will blow your cover, requiring you to trot out the overused, embarassing "My aging memory" defense.) Just a friendly tip, Marty. Ryan deleted a couple of my comments exposing a few more of your slipups (I guess I'll have to start archiving copies of my posts, Surur-style) but we've already started to see how fecolent you are now that rumors are swirling about Palm finally buying PalmSource. Please get some other PalmSource employees to join in here to help you out, Martyr. We need more sacrificial "fresh meat" - you're starting to smell moldy these days. Must be because you're "aging". PalmOS 5 should have been EOL in 2004. It is simply not realistic to expect Palm to plan a future around an OS that can't multitask if they're serious about PalmOS remaining a viable alternative to Windows Mobile, Symbian and Linux. While I believe PalmOS 5 could be a great OS if PalmSource could clean up the code, given their limited resources and the fact that it's a dead end, PalmSource won't be wasting much time on PalmOS 5. Yes, yes, and yes. And I should certainly hope that Palm does have plans to revamp the platform, because it desperately needs it. But I have seen people do stupider things, albeit not many. My interest is mainly on the point of Palm having committed to deliver Linux, even if only in a PR statement, versus simply being stupid not to. That is really the absolute least reassuring thing that you could possibly have said. I see your post illicited a storm of protest from the main Whiners. Why? Because you had the guts to question one of their pet theories. The lengths that the WinCE marketers go to never fails to amaze me. Of course, it's a sure sign of desparation. By the way, has anyone seen the FCC approval for the WinCE Treo yet? Palm/GNU/Linux? Would be sweet if they opened up the info on the hardware, I'd like to dualboot with a real linux. No GNU, just Linux. I doubt the carriers would sell phones that Palm set up to allow dual booting, so you'll have to take that up with them. I hate to be a persimist, but what is PalmSource planning on doing in the meantime? I mean, right now, we are in the third year of Palm OS 5. It has become hacked and hacked again in it's latest version 5.4.9.6.4.23.4.6.7.89.7.7. (sorry for the sarcasm) I fear that it will take a year or two to develop Palm OS Linux and by then, where will Microsoft be? Symbian? Blackberry? All of these are very much competitors for PalmSource. Do they have a plan? Please correct me if I'm wrong; I simply may be ignorant to their near future roadmap. RE: And in the meantime? We are SOL. Time will tell if Palm OS will survive. I do not know much of anything anymore and people who predict are mostly wrong(expect mike). If worse comes to worse there is always the Linux ports for the Ipaqs. Thanks for the link of the PSRC meeting. It’s about time we know what the hell PSRC has been doing. I thought they were just sitting around eating jelly donuts trying to make OS 5.9.9.9.9.9. Its good to see that MAYBE we will have a NEW OS in 3Q 2006. You're welcome. You should be aware, though, that PalmSource is promising NOTHING regarding how reliable that schedule will be. And remember, this is the same company that said PalmOS 6 (Cobalt) was ready in December, 2003. Almost TWO YEARS LATER, we still have no PalmOS 6 devices shipping. And don't be fooled by how PalmSource has publicly attempted to trivialize what a major undertaking PalmLinux (PalmOS 7) is. They have tried to make it sound like it was as simple as doing an engine swap in a vehicle. A better analogy would be that PalmSource is trying to retain the familiar car frame and interior, while changing everything else (engine, transmission, suspension, steering, electronics, tires, etc.) On top of this, PalmSource doesn't have a lot of employees, the company was just demoralized by major layoffs, and the remaining employees lack the skill set needed to quickly synthesize a Linux-based OS. Add in traditional Palm arrogance and unwillingness to bring in outside help (FINALLY now being done) and you have a recipe for disaster, with PalmLinux release dates likely to slip repeatedly over the next few years. The problem is that PalmSource's competition is ALREADY available and will have evolved even further by 2007 when PalmLinux might eventually be released. PalmSource has floundered since the Palm "split", but I expect things will get better QUICKLY when PalmSource is "bought" by Palm. If you'll remember correctly, Palmsource did exactly that. For 2 or 3 days people were moaning and whining about Coblat not being released. Then they did a PR saying that Cobalt actually did ship out to licensees before the new year. So actually they did fulfill the promise. Poor Skippy. Guess he's never watched Monster Garage, where they do that sort of thing in a week. > synthesize a Linux-based OS. Skippy, pronouncements like that would be a lot more credible if you had any idea who is working on the PalmSource Linux project and what their skill sets are. From your wild guessing about who I am and what I do, you've made it very clear that you don't. If my aging memory serves me correctly, Skippy, you've recently implied that programmers get paid overtime and Linux gurus are managers. Hard to imagine how someone with such little understanding of programming could judge the quality of the programmers, even if he knew who they were. But, once again, thanks for the laughs. Rebuilds are relatively easy to do if you have skilled automotive [or software] engineers, Marty. Unfortunately, PalmSource has shown repeatedly that they are rather lacking in that particular resource. Of course, outsourcing code to those who are more intelligent/able than the Holy Be Engineers will be a big help, but is PalmSource up to the task of integrating these desperate + disparate efforts? China MobileSoft codemonkeys aren't the answer. Who will be the The One that will step up to the plate and take over from Hoffman in fitting together all the pieces of the jigsaw puzzle that PalmLinux has now become? Could it be... Sing for me Marty! Serenade me the way George used to back in the Good Ole Days... Hope to see you at the performance in Redwood City today. Oh Marty, you're perseverating again. You still keep running from the issues here, but it's not like anyone will notice, right? And remember: we're not laughing with you, Marty, we're laughing at you.